Have you ever looked for a nut-free granola? It’s nearly impossible to spot in most stores, yet alone find one that’s filling and satisfying and not overly sweet. I know what you’re thinking, granola without nuts—that’s crazy. Believe me, I understand. I would put nuts in and on everything if I could. But since someone who lives in this house has a nut allergy, I’ve adjusted my consumption a bit. After all, I don’t want to be responsible for eating the entire package by myself. Well, after being disappointed by the commercial offerings, Brian and I decided to whip up our own special batch. We came up with a crunchy and sweet, but not overly so, mix. Hints of vanilla and orange zest give a pleasant kick, that’s just enough to help get you going in the morning. Rise and shine! 1. Preheat oven to 325°F. Line two baking sheets with parchment paper and set aside. In a large bowl, combine the oats, sunflower seeds, pumpkin seeds, salt and cinnamon. Set aside. 2. In a small saucepan, combine vegetable oil, agave nectar, maple syrup and orange zest. Use a knife to split the vanilla bean down the middle, remove the seeds and place in saucepan with the pod. Heat over medium-low until just simmering, then remove vanilla bean. 3. Pour the hot mixture over the oat mixture and toss until well coated. Spread in an even layer on the two baking sheets. Bake for 20 to 25 minutes, until browned, swapping the positions of the baking sheets halfway through. Remove from oven and let cool completely on the baking sheet, then break into small pieces and store in an airtight container. 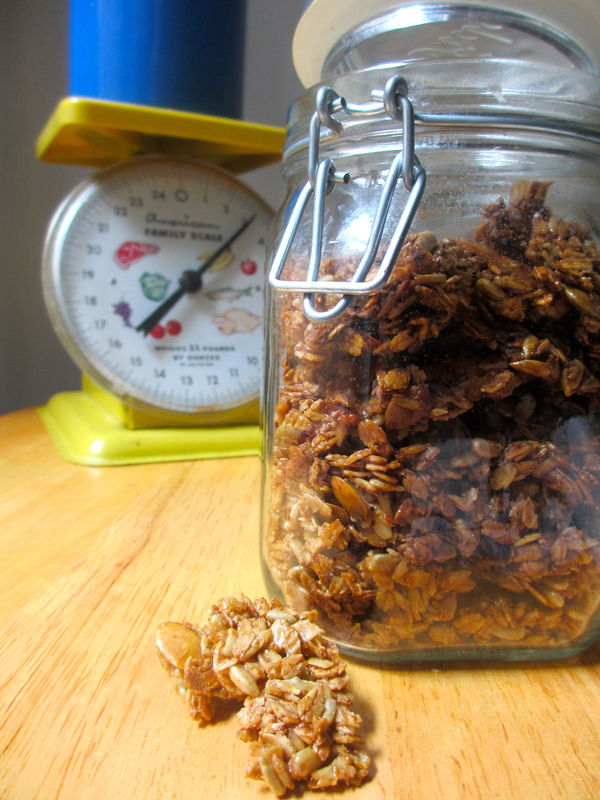 SWWU Tip 1: The granola will still be wet and soft when removed from the oven. Don’t worry, it will crisp up as it cools. SWWU Tip 2: Spread the mixture as evenly as possible on the baking sheets when cooking. Big clumps may result in uneven cooking and a less-crunchy final product. SWWU Tip 3: This recipe yields a good amount. Package some up in jars and share with your friends or family. This entry was posted in In the Kitchen and tagged @SWWUblog, breakfast, granola, in the kitchen, nut allergy, nut-free, rise and shine, vanilla bean by Something We Whipped Up. Bookmark the permalink.